West Indies team celebrating win. 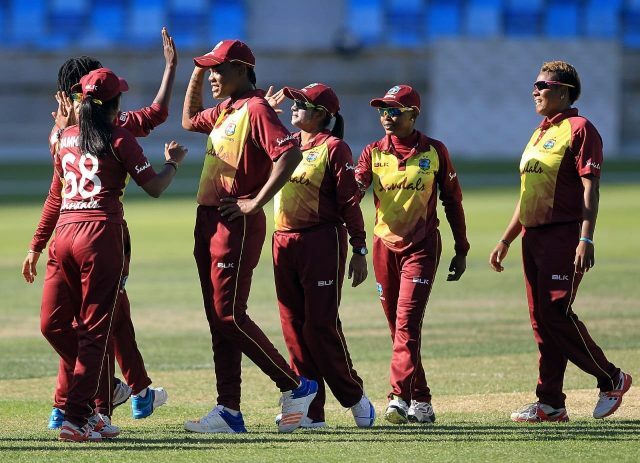 The WINDIES Women defeated Pakistan Women by 146 runs in the 1st One Day International as part of the ICC Women’s Championship Round 4 at the Dubai International Stadium. This match was historic as it was the first women’s match ever to be played at the venue. Not to be out done, Taylor soon reached her half-century and joined Dottin in accelerating the scoring. The skipper struck a few beautiful boundaries, however, on 58 and going after another wide-ish delivery, was caught by Sidra Ameen who plucked the ball out the air. This second wicket pair of Taylor and Dottin posted a 143-run partnership before Taylor fell. Shemaine Campbelle joined Dottin and the pair continued where Taylor left off. 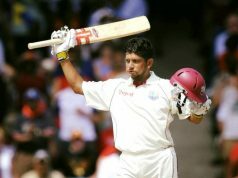 Dottin looked set to reach triple figures, playing a patient and hard-fought innings. She struck two lofty blows over the ropes much to the chagrin of the Pakistan bowlers. But on 96 and looking for one more big heave to take her to the magical triple figures, she got a top edge which landed safely in the hands of Nahida Khan. Chedean Nation made 1 while Natasha McLean made 3. Campbelle was joined by Chinelle Henry and the pair blasted the WINDIES Women well past 200. Campbelle struck 2-fours on her way to 26 not out while Henry hit one straight back to the dugout for a mammoth six to finish on 18 not out. WINDIES Women posted 216/5 from 50 overs, Dottin 96, Taylor 58, Campbelle 26 not out, Henry 18 not out. Kainat Imtiaz was the pick of the Pakistan bowlers, taking 3/49 from 9 overs. Shamilia Connell struck in the second over to remove Sidra Ameen for 0 as the WINDIES bowlers stuck to their line and lengths. Javeria Khan was given to lifelines when she was dropped by both and Taylor off Connell. Pakistan recovered with Javeria and Nahida Khan taking them to 45 in the 17th over, until Nahida was struck on the helmet when the ball deflected off her gloves. The physiotherapists of both the WINDIES and Pakistan teams rushed to the field together with medical personnel who attended to her, she was eventually stretchered off and did not return to bat. The WINDIES Women pounced on this opportunity to bowl aggressively to the new batter Umaima Sohail and the plan worked, Dottin trapped her LBW the very first ball she faced. More medical drama ensued in the over, as Javeria Khan who was deputizing as captain as Bismah Maroof missed the match due to an injury sustained in training, started cramping and had to be assisted off the field. Pakistan finished the 17th over with two new batters at the crease. The WINDIES relished their fortunes, as the pair of Nida Dar and Aliya Riaz, scored heavily against them during the T20 series. Taylor rotated her bowlers and shifted her fielders like an expert surgeon, with precision and make the right moves at the right moment. 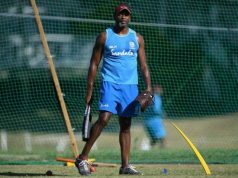 It paid dividends as Afy Fletcher scalped the wicket of Aliya, this then initiated a slide of four quick wickets as Dottin joined Fletcher to wreck the Pakistan middle order. Pakistan from 45/1, slumped to 70 all out. Javeria returned to bat but was bowled by Taylor for 21. Nahida retired hurt on 23, while bowler Aiman Anwer did not bat. Pakistan had two players who did not bat out the match. Deandra Dottin finished with figures of 3/14 and Afy Fletcher 3/17. The 146-run win by the WINDIES Women was their largest margin of victory in ODIs since 2013. The 143-run 2nd wicket partnership between Taylor and Dottin, was the second highest by the WINDIES Women, with the 176-run partnership between Taylor and Hayley Matthews against South Africa as the highest. Deandra Dottin was Player of the Match.